More water is being wasted in lawns than any other place. A lot of people simply don’t realize how much water they are using and most times, it’s too much. Over-watering can cause issues like weed infestation and lawn diseases. We’ve created this lawn watering guide to help you set up your lawn water sprinkler schedules based on your soil and grass types. Proper care for grass includes watering thoroughly, yet as infrequently as possible. A good watering once or twice a week for about 1 inch of water per week is ideal. A very common mistake is watering too frequently. Consequently leading to fungal diseases such as gray leaf spot, brown patch and take all root rot. Use a coffee can or something similar to catch water and measure the time it takes to get 1 inch of water to accumulate. Allow the soil to dry a bit in between watering, but not to the point of causing the grass to wilt. Here are simple tips to know effective watering of your lawn during hot weather. Watering at early hours of the Morning – The best approach is watering at the break of dawn. This is the best time to water lawn in hot weather and even in different climate such as the dry and cold climate. Mornings are best and most effective periods because evaporation at this time is low due to cooler temperatures and water is never wasted. Do not water at mid day – Do not water when the sun is high, simply because there is too much evaporation. A lot of water will be lost before it even gets into the soil. Do not water at night – A series of studies bring us to the fact that even though temperatures are cooler at nights, it is never the best time to water lawn in hot weather. This includes other climates such as dry, cold, or rainy as this could be hazardous to it. This could lead to having stacks of stagnant water in your lawn. This encourages fungal growth thereby causing harm to your lawn. A very common mistake is watering too frequently, consequently leading to fungal diseases such as gray leaf spot, brown patch and root rot. Watering over 1 inch per week might be too much. Over watering also promotes weed growth, so if you have a weed problem, you’re probably watering too much, but not necessarily. Most irrigation systems apply water faster than necessary, which wastes water through run-off. Stop watering for an interval if you see run-off occurring and allow the water to soak in before resuming. More Lawn Tips: Does Hydretain Work? Depending on your soil type, water soaks into the soil at different speeds. 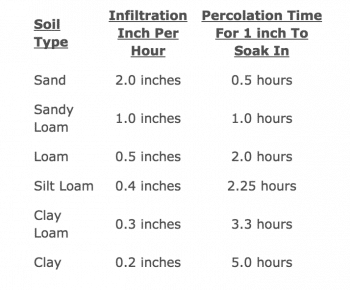 Knowing your soil type and how it reacts to water will help you determine how much water your lawn needs. No matter what kind of irrigation system or method you use, you’ll want to adjust it to the soil’s absorption rate. Apply water at a rate equal to or slightly less than the soil’s ability to absorb it. To measure 1 inch of water, place a can or several cans across the yard while watering your lawn. The time it takes for the can to accumulate 1 inch of water is the amount of watering time your lawn needs. A sprinkler timer saves you the hassle of turning irrigation systems off and on. You can set the timers to water your yard or garden in the early morning hours, or several times throughout the day. The most popular timers used are digital, and can be quite sophisticated. One example, the Rachio Smart Wifi Sprinkler Controller allows you to control your sprinkler system via your smart phone or computer. More traditional mechanical sprinkler controls are still used, but far less often than the digital timers. 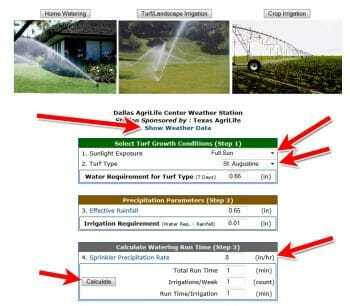 With Texas A&M’s lawn watering notification system, you can know how much water your lawn actually requires based on local weather conditions. 2. 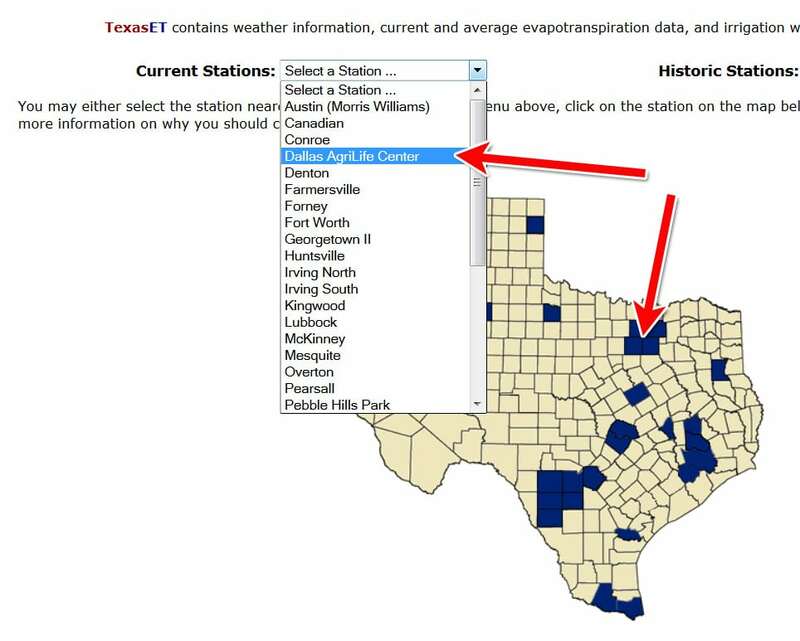 On the homepage, select a station nearest to you from the Current Stations drop down list or by clicking on a map location. 3. Select Home Watering on the next screen. 4. Use the calculator on the next screen to calculate the sprinkler run time and frequency for each watering zone. In Step 1, input the sunlight exposure for each watering zone (full sun, part shade, full shade). Then select your turf grass species. The value for Water Requirement for Turf Type will then be automatically added to the form. Step 2, Precipitation Parameters, should automatically be inputted for you. 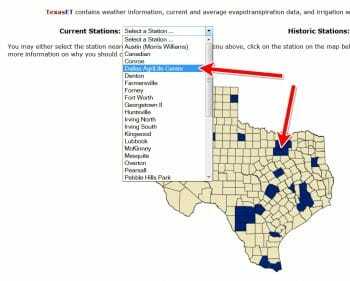 If not, then click the Show Weather Data link above the form and input the total Rain value. In Step 3, input the hourly precipitation rates you calculated for each of your watering zones. Total Run Time, Irrigation’s/Week, Run Time/Irrigation will be shown. Record these values for each watering zone and place a date next to this set. Periodically check the http://texaset.tamu.edu website and recalculate. Zoysia grasses grow from early spring through late fall when moisture and nutrient requirements are ideal. Zoysia is considered a great all around grass for the North Texas area. Usually Zoysia grass only requires about a little less than an inch of water per week. Bermuda grass is a drought tolerant grass that thrives well in the warmer climates. It is recommended that Bermuda get 1 inch of water a week, however it can survive when water rationing is in effect and 1/2 inch of water a week would be ideal for small periods of time. 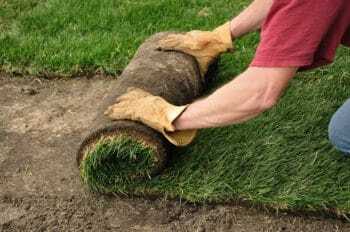 Begin watering new turf grass sod within a half hour after it is laid on the soil. It is important to water your grass once a day for two weeks. Starting the 3rd week you need to water every other day. By the 4th week you can resume your regular watering schedule of once a week. Apply at least 1 inch of water so that the soil beneath the turf is very wet. Ideally, the soil 3 to 4 inches below the surface should be moist. For watering tips after new sod installation, see the complete article on New Sod Grass Watering Tips. Proper watering should begin just before you seed a lawn, creating moist, inviting growing conditions. A few days before spreading the seeds, water the area to be planted to a depth of 6 to 8 inches. When you do this, add a little a compost to the soil to make it richer and more hospitable. Allow the area to dry completely before adding seeds. After sowing the grass seeds, they will need frequent watering on an as-needed basis. Keep the top 2 inches of soil moist, but not sopping wet. Water whenever the soil is becoming dry. Feel the soil to see if it’s moist or dry. If the soil gets too dry, the germination process will stop. When watering, do not water so much that it pools on the soil’s surface. If you have more questions about lawn watering, let us know and we’ll be happy to help in any way we can.